Don’t spend another minute studying research reports, staring at computer screens, or listening to financial broadcasts. Owning the Options Profit Zone home study course is like having a personal, in-house trading tutor on call 24 hours a day, 7 days a week. This is options trading made easy! You get it all for the low, low RISK FREE investment of $997 (plus shipping and handling). If you are not completely satisfied after using this system for 60 days we'll give you your money back. 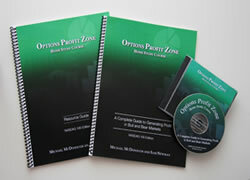 using the Options Profit Zone system.